We are very lucky here in Hoboken to have a diverse running community. Click on the links below to find out more. The Hoboken Harriers Running Club (also know as Hoha), founded in 1988, is a diverse group of co-ed runners and joggers. 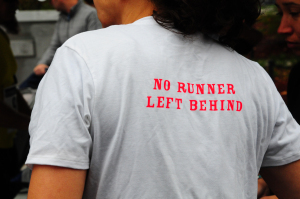 The Hoboken Elysianettes (HERS) is an all women's running club. The Gold Coast Triathlon Club (GCI Tri) develops a community of multi-sport athletes from recreational to elite athletes.